Incontinence is the inability to control the bladder or bowel. Incontinence is not just a problem for older people. It can affect men and women of any age. It should not be considered normal. It can often be a sign of other health problems. It can often be cured and other times it can be managed better with the right advice or treatment. Samson HealthCare Services has a solution to help solve workplace and institutional disposal of incontinence pads. The disposal of incontinence pads is a problem. Retirement villages & old aged care facilities generate a lot of incontinence nappies and our full replacement incontinence napkin bin service is the solution. 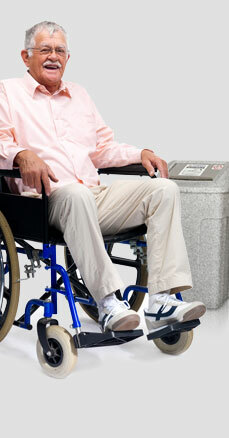 Samson HealthCare Services Incontinence Nappy Disposal System has a reputation for long and dedicated service. Specially designed 60 litre Incontinebce Disposal Units. Long term NSW Government provider. Each Incontinence pad bin is washed in a specially designed washing machine at high temperature to ensure each incontinence napkin bin is freshly sanitized and safe to handle. Each Diaper Disposal bin holds approximately 50 used nappies depending on nappy size. The Samson HealthCare Services Incontinence pad disposal service A nappy system designed for complete “peace of mind” for users. Ask us about our Incontinence Bin Service which include all our full range of washroom hygiene service including Waterless Hand sanitizers, disposable gloves and anti-bacterial cleansers.